I used to love Uber. LOVE it. Whenever I can't get a cab, which is often in San Francisco, Uber is there. I always knew it cost more. On average, it is about double the price of a regular taxi when riding within town. No problem - not only am I getting a nicer car with the convenience of not having to pay cash, I'm getting a ride when there previously was none. Now enter SURGE PRICING! I understand the laws of supply and demand, but I don't understand why Uber feels the need to nearly double their rates when there is a "shortage" of cars. And WHO exactly determines when there is a shortage? I recently used Uber to get home to the Sunset from Fisherman's Wharf during a "surge" pricing timeframe. The cost: a WHOPPING $84! It should NOT cost $84 for a ride across town. A fare review with Uber just generated a useless canned email response from Brian the community manager telling me all the ways in which I was advised of surge pricing. My beef is not with surge pricing. Fine, charge a little more when it's busy. I say charge a LITTLE more when it is busy, not A LOT more. 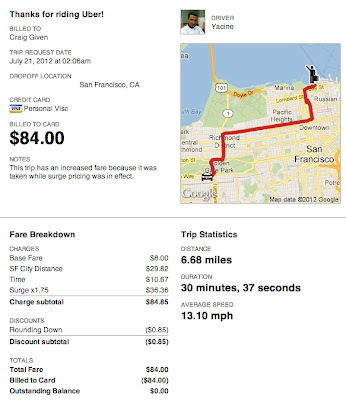 There is something seriously wrong with the Uber product, as a whole, when a fare across town costs $84. Oh and UberX - the supposedly cheaper alternative that sends hybrids instead of towncars? I've tried to use it at least 5 times and there is never a car available. 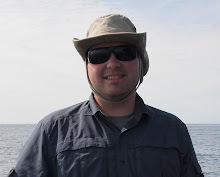 Craig Given, Jul 21 15:59 (PDT): I'm disappointed that this trip from downtown cost $84. It is way too expensive. I do not understand surge pricing, or how/when it is determined. It almost seems arbitrary. So, I'm just pointing out that a trip across town should NOT cost $84. I am definitely going to reconsider my future use of Uber if it is going to cost this much.